If we consider California power costs, based on the U.S. average for household electrical usage, the ordinary customer in Vacaville spends about $135 per month on their electricity expenses. If you have a swimming pool, lots of electronics or a large household, your bill is probably bigger. Solar power alters all of that! Considering a yearly average, some property owners are even able to slash their total expenses to zero. That’s the monetary advantage of getting your power from sunshine. Everyone knows that installing photovoltaic panels reduces your power costs. It is the upfront cost that scares most clients in Vacaville away from immediately seeing their utility expenses drop, in some cases even down to zero. We will talk about costs in a moment, but now let’s consider the environmental benefits. The Environmental Protection Agency decided that the ordinary American household uses almost 15,000 pounds of carbon every year just to provide electricity for their household. This shows that if you install photovoltaic panels, over twenty years you will go from dumping 300,000 pounds of carbon into the atmosphere to releasing a miniscule fraction of that amount. 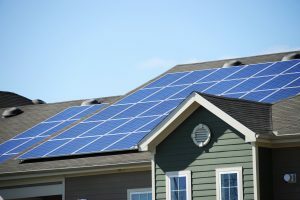 So if you want your property to help alter the balance on global warming, photovoltaic power is a terrific place to begin. How else can Solaron make photovoltaic cheaper? By means of ongoing incentive programs offered by governments and municipalities! As these vary based on your exact location and power utility, speak with a Solaron sales rep today to hear about these potentially significant savings!